Making important decisions about your family's future can be difficult -- and learning about the legal avenues that can make those changes happen can also be hard. These frequently asked questions are here to help those who are learning about asset division and nuptial agreements in Seattle. Do you have a question that isn't addressed below? Contact us today to talk to an experienced Seattle asset division attorney. 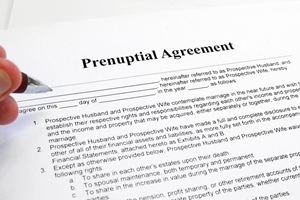 Can I write my own prenuptial agreement? When a couple is considering marriage and there are considerable assets involved, the thought of a prenuptial agreement may seem prudent. A prenup is a contract between two would-be marriage partners that determines how assets will be divided in the event of divorce or death of one partner. There are many websites that offer cheap or free “prenuptial agreements” for download, leading people to think that a prenup is a simple document that can be prepared without legal help. However, here’s what you need to know about creating a legal prenuptial agreement for your marriage. Prenuptials are, at their heart, a type of contract like any other. However, in order to be considered valid and legally enforceable, certain requirements need to be met. The courts generally take a dim view of any document that forces a person to sign away rights that have already been granted by the law. That’s why it’s important not only to have legal representation, but for each partner to actually have separate legal representation when drafting a prenup. You may even enlist the help of a professional mediator to help you negotiate the terms of your prenuptial agreement together. How assets are divided. Asset division will help determine which assets will be separate or non-marital property and stay with the original owner. In order for this to be valid, a prenup typically requires full disclosure of assets from each partner. If any assets are hidden at this point, it can invalidate some or all of the agreement. Alimony. In the event of divorce, spousal maintenance can be agreed on ahead of time. For example, this is typically used to protect the rights of one spouse who is married to a high-earning partner but stays at home to take care of the children. Financial responsibilities. A prenup may lay out certain financial responsibilities for each partner during the marriage, with penalties if these responsibilities aren’t met. Inheritance. A prenup can allow certain assets to pass to children instead of a spouse in the event of death. This may be especially important when there are children from a previous marriage to consider. It’s important to note that child support and child custody are not included in this provisions list because neither are valid items for a prenuptial agreement Your prenup may also include a termination of end-of-contract clause that puts a time limit on the terms of the agreement. After this time has passed, the prenup will no longer be in effect. If a divorce happens after this time, regular state laws on asset division will be used. Technical errors. If your prenuptial isn’t completed to legal standards and is riddled with mistakes, it’s not likely to be enforceable. No legal representation. If one partner doesn’t have an attorney to review the document and protect his rights, the court may invalidate the agreement. Coercion. Being forced into a contract, whether by physical, verbal, or emotional force or abuse, is not considered legally binding, and the prenup will be invalid. Disproportionate terms. Although the dollar amounts don’t have to be equal, when the agreement is severely in favor of one partner at the expense of the other, the court will not uphold the agreement. Prenups should never leave one partner destitute. While you can download generic prenuptial forms from many sites on the internet, only an attorney who knows your local and state laws will be able to help you and your partner with an agreement that’s both fair and will stand up to legal scrutiny. Have you got questions about your existing prenuptial agreement, or do you need help creating a new one? If so, the Law Offices of Molly B. Kenny would like to help you. Call or email us today to arrange a private consultation in our Bellevue office. When should we sign a prenuptial agreement? Do I need a mediator for my prenuptial agreement? Some couples are able to negotiate their prenuptial agreement without the help of a mediator, but others can benefit from the help of an unbiased third party. In fact, hiring a mediator to assist with your prenuptial agreement could ensure that you come to a fair agreement for both parties, and that your document will hold up in court if needed. A mediator can make certain that you are both communicating in a helpful, open, and honest way – and that neither party is being coerced or strong-armed into an agreement. A mediator can also help walk you through conflicts and disagreements related to the prenup, both by keeping you on track and by assisting you in understanding the other side. In a mediated prenup, the couple talks about the prenup face-to-face. Without a mediator, the prenup may be discussed by their lawyers or in a series of non-official conversations. The mediator can offer you advice as well as information about Washington State divorce law and how your prenup would change those laws. In addition, having a mediator can help prevent bad feelings from forming between you and your partner during the agreement process. You do not want either person to feel bad about your relationship before you are even married. You also do not want negative feelings and property issues to follow you to the altar. Do you want to learn more about legal issues that you should discuss with your partner before your wedding day? Watch Molly B. Kenny discuss Washington State prenuptial agreements and other related pre-marriage legal topics on New Day Northwest. How long before our wedding should we sign a prenuptial agreement? Last month, Bellevue divorce attorney Molly Kenny stopped by Seattle’s morning talk show New Day Northwest to discuss pre-wedding legal issues. One question Kenny answered was in regard to prenuptial agreements: how long before a marriage should you discuss a prenuptial agreement with your future spouse? The sooner that you speak to your partner about creating and signing a prenuptial agreement, the better. Six months out from your wedding date is a great place to start. Why do you need to think about this legal document this early? Prenuptial agreements need to be freely and fully negotiated. If your document ever comes into question, the judge will want to verify whether both parties were part of negotiations and how long details were discussed. If your agreement was drafted and signed very quickly before the wedding, it may be found invalid in court. You need time to get full disclosure. Each future spouse should have a full and detailed look at his or her partner’s assets, debts, and financial situations. No one should feel pressure. The sooner you speak about a prenuptial agreement, the more likely your partner will have time to get comfortable about the idea and figure out what they want the agreement to look like. You need time to draft the document. Getting a lawyer, negotiating the contract, and drafting the document takes time and planning. Do you need assistance with your prenuptial agreement in Washington State? Contact Bellevue divorce attorney Molly B. Kenny today at 425-460-0550. We’re standing by to help. While the initial idea of a prenuptial agreement can be unromantic at best and offensive at worst, it can also be seen as an opportunity for both parties to protect their interests and assets in the case of a divorce down the road. Even if you don’t have assets to protect, a prenup can be an opportunity to settle the division of property and avoid a costly legal battle in the event of a divorce. However, before you sign a prenuptial agreement, it is extremely important to be open and honest with your spouse – and it is extremely important that you agree with everything written in the document. Don’t agree to an unfair prenuptial agreement because you don’t think you will ever need to use it. Be wary of fault clauses or agreements that don’t expire or change after a certain number of years after marriage. A prenup may force a tough discussion (or series of discussions) between you and your betrothed. However, it may well be easier to have these talks now than later after your relationship as turned sour. Do you have questions about a Washington prenuptial agreement or about Washington State divorce? Contact Seattle divorce attorney Molly Kenny to schedule a private consultation. Prenuptial agreements are not just for the super-rich and the super-famous. If you would like to protect your property, assets, or your children from a previous marriage – or if you would like to protect yourself from a spouse’s debt – signing a prenup may be a wise move before you say “I do”. You should especially consider a prenuptial agreement if you are entering the marriage with significantly more assets than your spouse, if you own a business, if you expect to significantly increase your assets after your marriage, if you have children from a previous relationship, or if you have a nest egg. Instead of thinking of a prenuptial agreement as a way of barring your spouse from the assets that he or she may be legally entitled to during a divorce, it is best to think of a prenup as a document that clarifies the financial rights of each spouse. It’s a chance to discuss the distribution of property in the event of a divorce before things go sour. Do you have a question about a prenuptial agreement, a divorce, or the division of property? Contact our prenuptial agreement attorneys at Molly B. Kenny today.